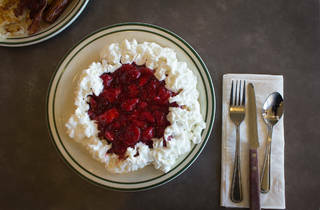 Photograph: Michael JulianoStrawberry waffles at Norms. 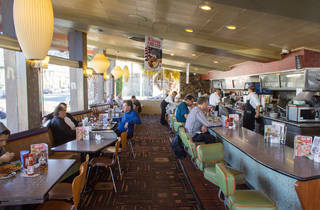 The oldest surviving restaurant in the Norms family, this Googie icon has welcomed drivers along La Cienega since 1957. Though the interior has lost some of its sparkle, its defining features are still in tact: bucket seats, a slanted ceiling and large, zigzagging windows. The car showroom-like exterior is still dazzling thanks to its sharp, pennant-shaped sign and cantilevered roofline. Though the restaurant has changed owners and faced a demolition scare, the building’s future is safe thanks to its recent Historic-Cultural Monument designation. 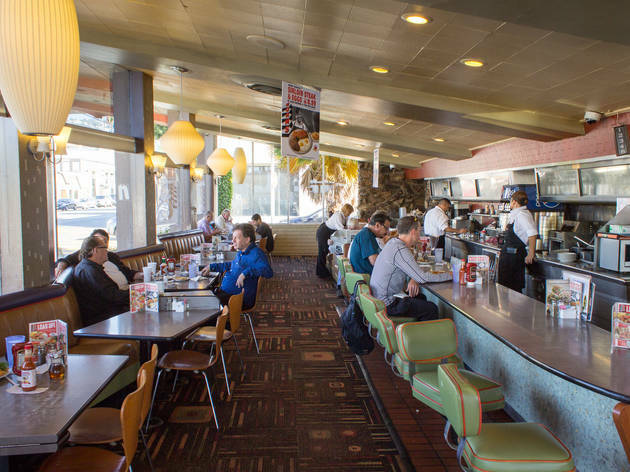 Sitting down at one of Norms cozy booths, you might be handed four or five different menus—a multi-page full menu, a breakfast menu, a low-cal menu, and occasionally a special menu detailing the diner's baby back ribs selection, just for good measure. During the weekday, a Bigger Better Breakfast is available from 4am to 2pm at the commendable price of $6.59: two eggs, two sausage links, two pieces of bacon, two hotcakes, hash browns and grilled ham. It's a sizeable spread, but nothing particularly stands out. To give it a little oomph, upgrade the hash browns to a fully loaded version with bacon, cheddar cheese, green onions, diced tomatoes and salsa. 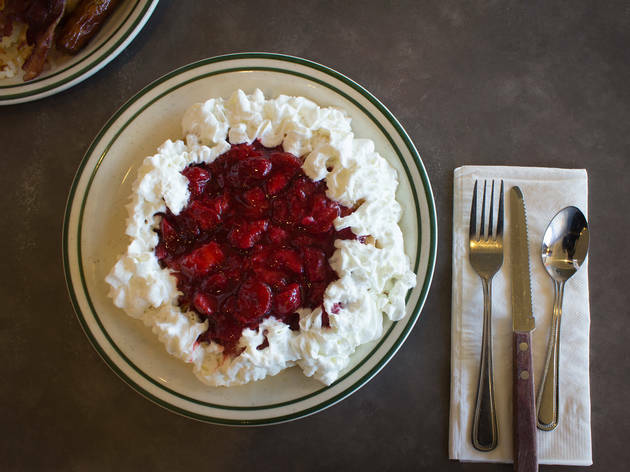 Sweet-toothed diners may be drawn to the strawberry waffle instead, which sags under the weight of stewed berries and a generous spray of whipped cream. 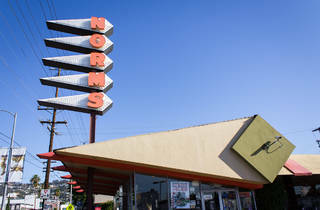 Prices cannot be beat at Norm's. Great for a quick diner-type breakfast or lunch. Great low prices, fast service. Eh. 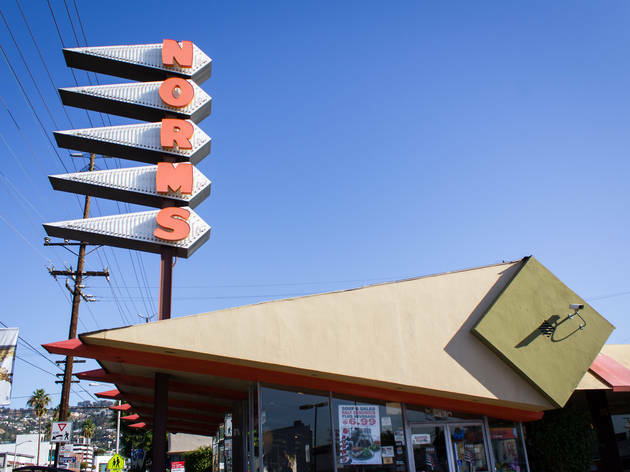 Norms' finest qualities are best enjoyed from outside; its sign and roofline are pretty iconic. 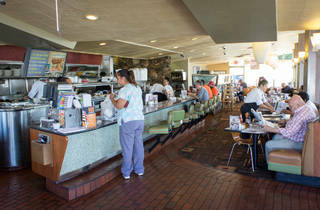 But the food is pretty underwhelming, and the interior lacks the same Googie charm that the exterior possesses. 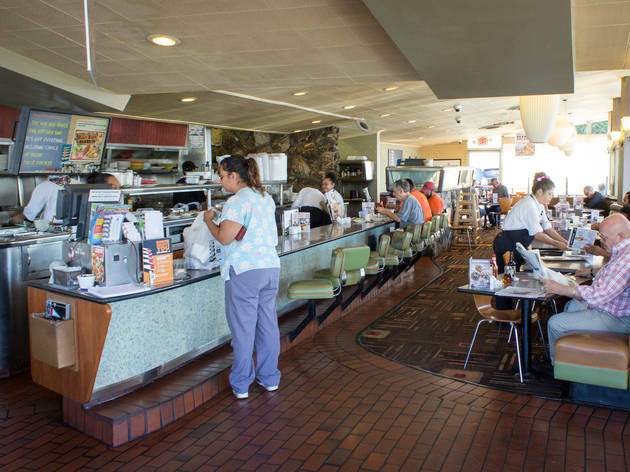 If you're desperate for some breakfast food after a show at Largo then sure, why not, but otherwise there are far better diners in town.